It is a fact that if anyone decides that they want to do any investigative research on Agenda 21 they will find that many environmentalist websites tend to report how it is a stupid conspiracy theory and that the notion that there will be a jackbooted green police waiting to take your property is just outrageous. One particular website that jeers the conspiracy theories is Slate, providing an article from a website called “One Earth” in their article, ‘Agenda 21: No, The Government isn’t Going to Confiscate Your Property‘. “Pssst! Have you heard about Agenda 21? The secret plot to collectivize private property—hatched by United Nations internationalists and midwifed by operatives ensconced within our own government—all in the name of “ending sprawl” and “encouraging sustainability”? The seizure of suburban homes by jackbooted, gun-toting U.N. thugs? The involuntary relocation of displaced suburbanites to cramped dwellings in densely packed cities? It goes on to make fun of people who have been warning Americans that there is a plot by the government to seize property and to move American citizens into the big cities. It cites the ‘black helicopter crowd‘ as being paranoid and that the “green helmets” won’t be seizing property anytime soon and that the conspiracy theorists claim that it is part of a secret plot to rid the planet of human beings in order to achieve global sustainability. The article that was published by Jeff Turrentine is a smear and shaming piece that redeems the “Future Earth” fanatics and marginalizes those who worry that they may become refugees in their own country if the feds or even the United Nations decide to take property rights away from the United States citizens. The article was written a long time before we knew who Cliven Bundy was or before Harry Reid compared the actions of the militias at the Bunkerville Ranch with the Boston Marathon bombers and before the actions of Frazier Glen Miller, a known neo-Nazi that went on a shooting spree at a Jewish center in Kansas City. Back in July of 2011 I reported that the UN was proposing the idea of creating an environmental security force, known as the “green helmets” to intervene in conflicts caused by resource depletion in rural and remote regions of the world. The green helmets will be a “green” or environmental police that will enforce resource distribution in countries where food, water and other resources are scarce. Now, the media has been buzzing about what has been happening with Cliven Bundy, and yet there are many stories about how the military an or the federal government have forced citizens out of their homes without giving them dime one of compensation for their inconvenience. One example is the CANAMEX highway that was being planned for an area of Arizona 70 miles southeast of Phoenix. “It is time to connect the dots on one leg of this land grab in Nevada. The I-15 Canamex Highway runs adjacent to the planned theft of the Bundy property. In this location, a new Agenda 21 land designation is emerging and it is called a “Solar Energy Zone”. Solar Energy Zones will connect the variables of the Canamex, the evisceration of private property rights, land use delineated in the Agenda 21 Wildlands, the control of all transportation corridors within the United States and the ultimate betrayal, the Chinese control of all military bases in the United States. He also reports that 300 homeowners were asked to leave their homes because the government needed water in order to operate the CANAMEX international multimodal hub. They could not have 300 residents in a rural area put a drain on the reservoir that was nearby. John McCain convinced local politicians to legislate against the residents that lived near the Arizona hub and stripped them of all their property rights in an attempt to force them out over a period of time without compensating them for the loss of their homes. This puts a lot of what is happening with the Nevada land grab into perspective. As far as I can see, no agent of the BLM was harmed in the incident. I got in touch with Deborah Tavarez after she returned from the Bundy ranch and she related to me that what we are seeing with the Bundy standoff and what we will see with future standoffs and run-ins is an effort by pundits of “Future Earth” and Agenda 21 with the aid of the banks and corrupt politicians to push for different ‘forbidden zones‘ all over the United States. If you want to be enlightened you may want to check out an article published on Forbes called “Earth’s Future Forbidden Zones” where UN planners intend to restrict your lifestyle to postpone the supposed coming environmental apocalypse. Many of the global sustainability fear mongers have been pushing the agenda that the world is doomed and that they have the answers to combat or avoid an ‘extinction level event‘. The concept of ‘Earth’s Future Forbidden Zones‘ is not new. Agenda 21 has been championing a similar concept that they claim is there to protect the planet from the people. While many people believe that the United Nations Agenda 21 ‘sustainable development’ plan, is plan to cull the populace for sustainable development, there is more to it than just the elimination of useless eaters. It is also a plan to control all land use for full-spectrum control. The statistics of land ownership and the ability for the BLM to create forbidden zones will most certainly create more Bundy ranch-type stand-offs in the future. As Inquisitr.com reports, “The BLM (Bureau of Land Management) wields power over about 460 million acres of the 2.27 billion acres of land in the United States of America. Those in the camp of “global sustainability” believe that people are not good stewards of their own land and that the government will do a better job of land management if they have control of property. The right of the individual or of the sovereign no longer applies, according the ‘Future Earth’ planners. Individual rights and individual property rights will give way to the needs of the community and, in some cases, the needs of the military industrial complex. Programs like the Wildlands Project are programs that indicate that most of the land should be set aside for non-humans. Sustainability encompasses all things environmental – including global warming, climate change and alternative energy. The fear mongering that has been created by ‘Future Earth’ planners is actually an apocalyptic blueprint that sets that timetable between now and 2050. The ‘Future Earth’ proposal explains that the population is exploding, wild species are endangered, the environment is degrading and the costs of resources from oil and water will be going up. Therefore it is believed that the government has the wisdom to use the land to benefit future generations. In a war for sustainability, ‘we the people’ are the enemy if we stand in the way of their “Future Earth” agendas. As the global planners hook you with “climate change” and the socially engineered “saving the planet from the environmental cataclysmic model,” we could very well see in the future an urgency to justify laws requiring people to be forced from their homes and lands because of some trumped up crisis that needs to be averted. However, the common vision is for the elites and not the average American. The common vision they speak of will be implemented through patterns of force, coercion, intimidation, and deadly force. ‘Future Earth’ planning is the idea of implementing Agenda 21 forever. 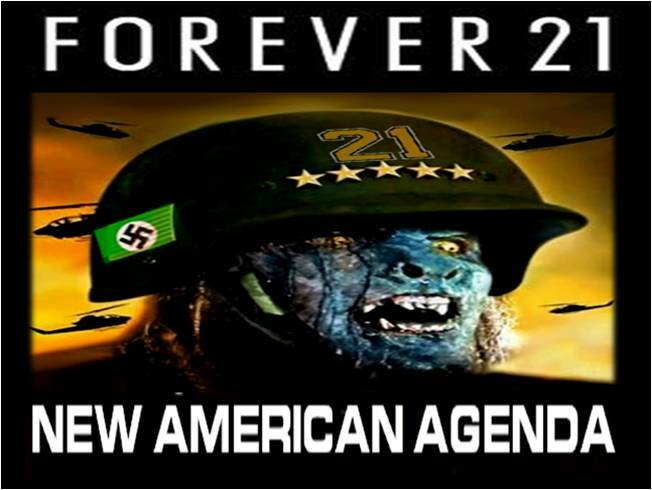 For some it will be the new American agenda, for others it will be the jackboot knocking on your door with back up artillery, forcing you out of your home, making you a refugee on your own planet.